With the consolidation that has happened and continues in the ocean carrier market, you need to protect your margins. That means you need complete transparency from your operation, including up-to-the-minute information on chassis availability, so you can schedule, plan, and meet your demand. Our legacy of exceptional service for ocean carriers means that we’re uniquely attuned to your specific needs and can provide the technology, resources, and expertise to grow your share of the market. 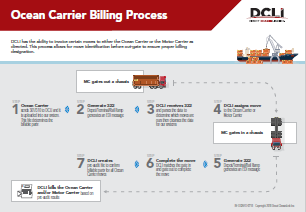 Download our Ocean Carrier Billing Process infographic to see how our process works. No other IEP knows ocean carriers like we do. You can depend on DCLI.